While things look as if they are on track for Microsoft in regards to the rapid distribution of its new operating system Windows 10 -- the company wants to push it on a billion devices in the next few years -- things are heating up in regards to privacy. Windows 10 users can turn off most of the invasive tracking, data collecting and reporting features the operating system ships with -- check out our privacy tools comparison for Windows 10 for links and information -- but even if that is done carefully, data is still collected and submitted to Microsoft. Vaughn Highfield over on Alphr points out another issue that many user of the operating system will dislike if they find out about it. Microsoft updated its EULA terms recently in regards to counterfeit software and unauthorized hardware. Sometimes you’ll need software updates to keep using the Services. We may automatically check your version of the software and download software updates or configuration changes, including those that prevent you from accessing the Services, playing counterfeit games, or using unauthorized hardware peripheral devices. What this means, in plain terms, is that Microsoft may block you from playing counterfeit games and using unauthorized hardware on devices running Windows 10. Most users will have two issues with this approach. First, Microsoft fails to make any mention on what unauthorized hardware peripheral devices mean. The process of labeling devices as unauthorized is unclear, as is the scope of it. Second, to block pirated games from running, scans need to be performed to detect these programs. While some users may agree that blocking pirated programs from running is a good thing, privacy-conscious users will dislike its impact on the system and privacy. If you look up what Microsoft means when it says Services, you find the following list on the website. It includes many Microsoft products, for instance Bing, the Microsoft Account, MSN, Cortana, Office, Outlook, xbox Live or Xbox and Windows games published by Microsoft. Windows 10 is missing on that list, and the most likely explanation for the change is the upcoming launch of Windows 10 on Microsoft's Xbox One. If that is indeed the case, the company reserves the right to block copied games from playing on the device and to block unauthorized hardware devices from working on it. This would explain why games are mentioned in the agreement but applications are not. It would also mean that this won't apply to desktop systems running Windows 10. Highfield believes that this applies to Windows 10 computer systems as well but there is no indication that this is indeed the case. Since Windows 10 is not listed, only the services listed by Microsoft fall under the agreement. Microsoft updated its services agreement recently stating that it reserves the right to block pirated games and unauthorized hardware. Have they reserved the right to remove and/or block the use of Third-Party Apps and Services? My first reaction was to utter some “strong” words towards Microsoft; but I will just say that it is not Microsoft who decides what hardware or software I use on my computer. They might change their EULA how they want and take what measures they like, I’m sure people will come up with software countermeasures to render their blocking ineffective. What if you patch a game that you own because an old DRM system prevents it from running anymore? GFWL I’m looking at you. 1. They don’t need to mention Windows 10 in this agreement, as you already clicked the Win10 agreement when you installed the OS … and that one has the ‘we can zap you if we so choose for running an unauthorized or pirated version”. This is for Windows Services only. 2. Hardware. They aren’t talking about your desktop or laptop hardware. Win10 can be run on devices like Pi for example (a modified version). Win10 has also been seen running on an android based phone hardware. For giggles, I actually installed win10 on an asus android tablet (with effort and not without ongoing issues that I didn’t bother trying to resolve). Lord knows that other hardware people will try to install it on :) Maybe PS3’s into Xboxs? I imagine that this clause covers this sort of activity. 3. Software. Again, this EULA only covers MS Services as listed at: https://www.microsoft.com/en-us/servicesagreement/#serviceslist If your desktop game say is pirated, it is not covered in this list; however, if your xbox live game is, BAM. 1. You agreed to be bound by the Microsoft service agreement when you agreed to the Windows 10 EULA, section 14 of said EULA links and binds the Windows 10 EULA to the Microsoft service agreement. 2. Do you have a citation from Microsoft saying that section 7 of the Microsoft service agreement doesn’t apply to desktop or laptop hardware? 3, Incorrect, read section 14 of the Windows 10 EULA https://www.microsoft.com/en-us/Useterms/Retail/Windows/10/UseTerms_Retail_Windows_10_English.htm “You understand that by using the software and services, you ratify this agreement and the linked terms.”, and those linked terms are the Windows 10 Privacy Statement (aka.ms/privacy), Microsoft Services Agreement (aka.ms/msa), and Adobe Flash Player License Terms (aka.ms/adobeflash). You can’t start reading a legal agreement at section 14! Start at the beginning where it provides the scope. True as you can’t read the EULA before install or even buy the product. And they can apparently change this at will , but that is besides the point here. EULA has no legal ground in most of european countries. As part of our effort to improve your experience across our consumer services, we’re updating the Microsoft Services Agreement and the Microsoft Privacy Statement. We want to take this opportunity to notify you about these updates. The Microsoft Services Agreement will cover most of Microsoft’s consumer online services, including Xbox Live, Bing, MSN, Skype, OneDrive, Outlook.com and Microsoft account. You can see the full list here. The Microsoft Privacy Statement also covers most of Microsoft’s consumer products and services. The updates will take effect on August 1, 2015. If you continue to use our services after August 1, 2015, you agree to the updated terms. If you do not agree, you can choose to discontinue use of the services and close your Microsoft account before August 1st. If you are an Xbox Live subscriber, you will be prompted soon to accept the terms when you log in to Xbox Live on your Xbox One, Xbox 360, or at Xbox.com. If you are a parent or guardian, you are responsible for your child or teenager’s use of Microsoft services, including purchases. Did anyone say I started reading at section 14? Fact is I’ve read the entire Windows 10 EULA and all the linked documents, it’s part of my job. Perhaps you’d care to point out this “scope” you’re referring too, the scope that you think means the Microsoft Services Agreement does not apply to Windows 10. Seriously? They are going to decide what I plug in to my PC and disable ti if they don’t like it? Or is this just a case of extorting hardware vendors to certify (and a big payment to msoft) their hardware? Wrong. There’s no indication that it DOESN’T and therefore it DOES. I don’t understand why people assume the verbiage only applies to Apps or Cortana or some other subset and not the entire OS and everything on the PC. Is it disbelief or wishful thinking? MS has used broad reaching language on purpose. Using words like “and more” allows them to increase their reach almost infinitely. And forced updates ensures that they can. Their EULA reads like a web service and if a piece of software did the following , what would you call it? To me Windows 10 looks like Facebook with malware. How many corps and gov’ts will be moving from Windows 7 to RHEL and will the EU investigate? That’s where things are at this point. I think it makes sense for their app store, MS literally runs it and gets a 30 percent cut of sales. The store is awash with pirated apps, like unauthorized Nintendo games. In the past, MS has yanked those apps from the store and presumably from people’s computer while refunding all the customers who bought it. Google and Apple does the same thing with their apps. Good policy to cover your legal behind. I hope you aren’t right about the desktop though b/c even the best interpretation of legal speak doesn’t really matter until a court rules on it and usually forced to by a lawsuit. I am getting antsy on the nature of Windows 10, it just seems so arbitrary, nothing about it in the previews or anything. Desktop should not a walled garden and it isn’t even necessary if they want to cover themselves b/c it doesn’t have the legal pitfalls associated with an app store. With upcoming TTIP forced incorporation (it’s likely impossible that whole agreement will be thrown away – our politician are already sold to US and their corporations) on European soil I doubt if neither EU or MS would like to change anything. January 14th, 2020 actually, but I get your point and totally agree. I too am still on Windows 7. Extended support dates are irrelevant for most users since security patches are expected. Main support is what matters and that ended in January 2015, and that was for SP1 since users of Windows 7 without SP1 had already lost all types of support in 2013. XP’s main support ended in 2009, by the way, and even back then, only SP3 was supported. Speaking for myself and every other Windows 7 user I know, extended support — security updates — is pretty much the only thing that matters. The same was true for XP. Seems, as time goes by (and not much time), more and more disclosures are making Win 10 a no-go. Agreed. My rejection hardens by the day. I have a toy system, a Dell Venue Pro 8 tablet with Win 8, that I use as a quick and portable demo box for an application I’ve developed and I may install Win 10 on that because there is nothing private on it but my main working system will never see it. Be aware that your use of MS services (Mail, OneDrive etc.) could be artificially limited by making features exclusive to Windows 10. Gmail and Dropbox aren’t going to be artificially limited for Windows 7 users. Neither will iOS or Android. As abood points out, that’s only a temporary solution. If you’re uncomfortable with Linux and you’re in the market for a new computer in 2-3 years, do you buy a Mac or what? In other words, you may have to make a decision before 2020. I highly doubt that MS will limit their online services to Win10, because it is counterproductive to lose users, so I wouldn’t worry about such an event. As for Win7, only time will tell how long it will be supported by hardware manufacturers and software developers after 2020. Who knows what the future will bring? So for now, Win7 is a safe bet. “IF YOU LIVE IN (OR YOUR PRINCIPAL PLACE OF BUSINESS IS IN) THE UNITED STATES, PLEASE READ THE BINDING ARBITRATION CLAUSE AND CLASS ACTION WAIVER IN SECTION 15. IT AFFECTS HOW DISPUTES ARE RESOLVED. 1. covers the use those Microsoft’s consumer products, websites, and services listed here (the “Services”). Not adobe, not McAfee … MS only. 3. The separate terms being replaced only refer to those on the list. Windows 10 is not on the list, so the original agreement you clicked is unchanged. Clearly this one article, that has not been widely picked up, was written with the intention to drive traffic through irresponsible blogging. 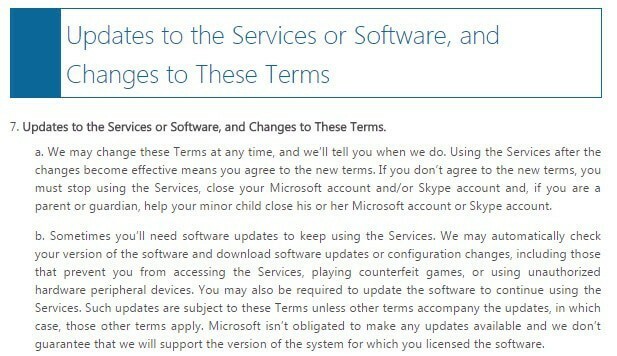 By agreeing to the Windows 10 EULA you’re agreeing to those linked agreements, and even if you want to claim that as Windows isn’t listed in the services section that it doesn’t apply to Windows various Windows services are listed – and as these are bundled in with Windows 10 the Services Agreement de facto covers Windows as well. Basically, Microsoft could disable a hooky copy of Office using an update to Cortana – or even, the ‘Default Homepage and New Tab Page on Microsoft Edge’ – and be in the clear. Also FYI this one article HAS been widely reported, I would even go as far as saying that Martins blog wasn’t the first to pick up on it (no offense intended Martin), you only have to use Google http://lmgtfy.com/?q=microsoft+unauthorized+hardware to see that for your self. Corky .. Office is specifically listed in the services list. What the article is suggesting however, is that MS can also disable say an illegal copy of Adobe Photoshop or any other software. That is clearly not what the agreement says. Adobe Flash Player. The reason it is in the new EULA for Win10 is because it is bundled now. If MS chooses to ditch it, then they can; but you can also put it back; however, they can’t by the agreement stop you from installing it yourself (let’s not get into why Flash must die though lol). I assume that you are not a lawyer (btw, I am), and regardless, neither of us are lawyers for MS. I think we have enough pretenders offering their ‘legal opinion’ on the subject. As for being picked up by other sites… NOPE; NONE of the majors have reblogged this nonsense (sorry Martin). And many of the links in the google search have modified articles that cut the incorrect statements out. No, what the article states is that.. “Microsoft reserves right to block counterfeit games and disable unauthorized hardware” ,what it fails to mention is that section 7(c) also reserves the right to remove and/or block the use of Third-Party Apps and Services. And before you say Windows isn’t listed in the services section so it doesn’t apply it’s worth reiterating that the only reason Windows is not listed is because Windows itself is not a ‘service’ (yet), which is why it’s not listed under the Microsoft Services List. However, various Windows services are listed – and as these are bundled in with Windows 10 the Services Agreement de facto covers Windows as well. I also don’t know why you keep mentioning Adobe, apart from that by agreeing to the Windows 10 EULA you’re also agreeing to those licensing terms I can’t see what relevance they have to either the Windows 10 EULA or the Microsoft services agreement. Finally what would you consider a major site, because at first you claimed that this had not been widely picked up and now it’s been shown that it has indeed been widely picked up (long before Martin decided to cover it) you’ve now decided to move the goal posts by claiming that no major sites have covered it, so forgive me for wanting to clarify your opinion it’s just I wouldn’t want you moving them goal posts again if, or when one of the “majors” cover it. So now this story has hit the majors have you reconsidered that Martin and other site didn’t publish this with the intention to drive traffic through irresponsible blogging, and that it’s not nonsense Rick? Or are you now going to claim that a national UK newspaper is not a major? The problem here is (and has been from the beginning) that Windows10 was built as a unified OS. Desktops, tablets, phones, consoles, they all run Win10. The unified architecture is bringing unified legalese. This kind of scary draconian privacy invading crap is par for the course in the mobile and console world – and you’ll notice not much WTF is coming from those camps, it’s only the desktop environment that has been bubbling over with rage. I’m still not touching Win10 though. Every piece of the OS was obviously built for mobiles and consoles with desktops not getting much (if any) consideration. Not interested in increasing market share for a product that sees me as an afterthought. Why do you sheeple put up with Micro$oft? I switch to Ubuntu 7 years ago and haven’t looked back! You can take charge and be a man or do nothing and continue to be sheep. Linux evangelist are something else aren’t they? They really can’t imagine someone else using computers differently from them. Besides games which is a big part of Windows appeal, how about business applications and productivity applications? They really don’t know how and what kind of software that engineers depend on for construction, design and so on. The software that literally is worth thousands of dollars b/c they are so specialized and niche for Windows and to a much lesser extent OS X machines. I am sure it is the same in other professional fields. Then you have run of a mil productivity like Office. I would like to not pay the hundreds of dollars for MS office like the next guy, but Libre Office doesn’t really compare to MS office in terms of comparability and function. If Linux works for its users all the better for them, but people like Paul are doing more harm to linux’s rep than anything MS ever could. Oh,you mean the version of Ubuntu Unity that phones home at Amazon when you use it’s dash,lenses,whatever,great alternative! You can play games on a console and use Ubuntu for everything else. You will stop playing games sooner or later. George Orwell 1984 dystopian novel, who is set in a world beyond our imagining should call 2015. A world where totalitarianism really is total, all power split into three roughly equal groups–Eastasia (Microsoft) , Eurasia (Apple), and Oceania (Linux). Can we all go back to Windows XP? or even PC-DOS? I never left Windows XP and that decision is looking better and better as time goes on. but I don’t have to read the Windows EULA each morning when I get up and my Office 2010 installation continues to function. Paul does have a point, though. MS is unlikely to change their policies–surely they have a sea of lawyers and economists who mapped out the legal and financial implications of their decisions, and decided to go with them anyway. Apple’s lack of transparency and user control makes them equally unappealing. I am on Windows 7, but I am fervently hoping that Linux developers and investors may see this as an opportunity to create a truly viable open source alternative. SteamOS is doing wonders for Linux gaming, with triple A games like Dark Knight coming. Though OpenGL still remains bad alternative for DirectX, it just isn’t technically there in features, tools basically everything. Hopefully Valve can get it in shape or if working with the Khronos group is too unwieldy, fork it and give it parity with Direct X. However, enterprise will be a tougher nut to crack. Nothing in the Linux worlds beat the 10 year support cycle of Windows. Business are notorious for valuing stability above everything else (aka Windows XP fiasco). Make your software and it will theoretically run on the same platform for 10 years. LTS for Linux is typically 5 years, which is a problem. IBM’s just announced choice of Ubuntu as the OS for its new LinuxONE mainframes might well impact that support cycle. “Your privacy is important to us” … and we want ALL of it. How about this scenario? You have a LiteOn DVD burner with modded firmware that you use for backing up your X-Box 360 games. I have trashed at least 2 discs when the console was vertical and I pulled or tripped on the wired controller cable causing the X-Box to tip. GameStop replaces them only for 90 days after purchase. After that, you are forked. Microsoft has no comprehensive policy about replacing scratched discs. They put the low bidder cheapest drive in their consoles. Drives which don’t hold the disc securely. They have been sued for this. I can see them taking the next step past UEFI BIOS where every hardware device running in a computer using a Windows OS needs a “Microsoft Approved Firmware” or the device gets deactivated for “Security Reasons”. As for the privacy aspects that several others mentioned, hosts file on your router? Black listing/white listing all these domains to get your privacy back? What a PITA! Microsoft can not afford to be too evil. They can lose too much. Google could steal all their users pretty quickly. or Apple or some other big SW company. Linux would be a really long shot. My guess is that they will make accommodations as complaints come in. Lawyers did not make the company, but it looks as if they could sink it. I think that Micro$oft is already expecting piracy on Xbone, this is why they creating these ridiculous Eulas. Micro$oft is too stupid to pull a stunt like that, Windows 10 like Win7,Win8.1,office, etc, can be pirated/hacked with ease. They gonna ask every game or software developer to hand over the exe’s hashes, so they can allow it to run on Windows 10? I don’t think so. Windows is the most exploitable piece of software in the face of the earth. I already only use Windows for gaming, and I do use “counterfeit” software like (trainers, cheat engine, memory editors, no dvd’s to remove drm from old games on dvd) but I only play single player games.